As many of you know around the country, we are all sweltering out here. The midwest is extremely hot and now it's headed to the east coast. I really didn't want to turn on the oven to bake chicken so I dragged out my trust crockpot. My crockpot has become my best weapon against heating up my house and getting in some extra knitting time. I love to grill more but hubby isn't getting home at a decent time these days and I am not the grilling queen. So I take the easy way out. Hubby bought some skinless chicken thighs because I had thought about grilling them out on the weekend. I changed my mind when the sky opened up last weekend and just poured and poured. So I had to be flexable and find something that didn't need to be grilled. I got out my Slow Cooker Bible and thumbed through it. 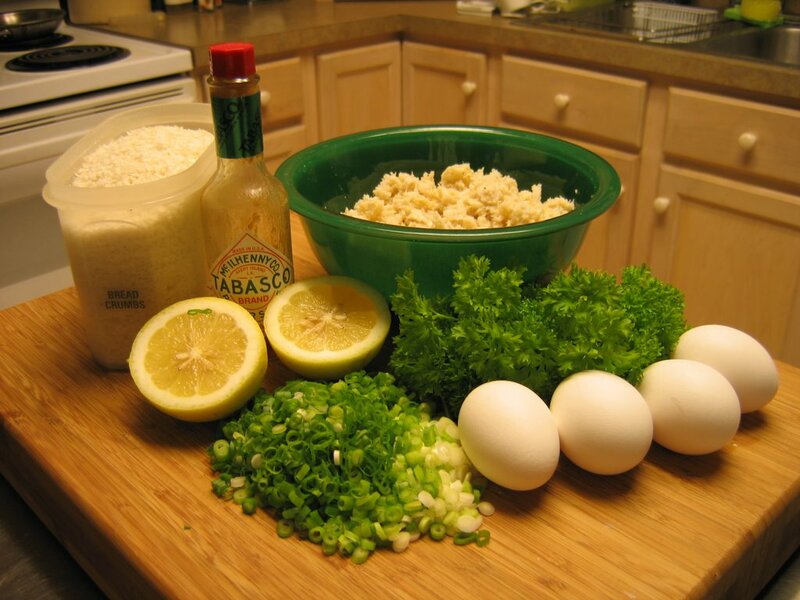 Most of the recipes are very simple with basic pantry ingredients. 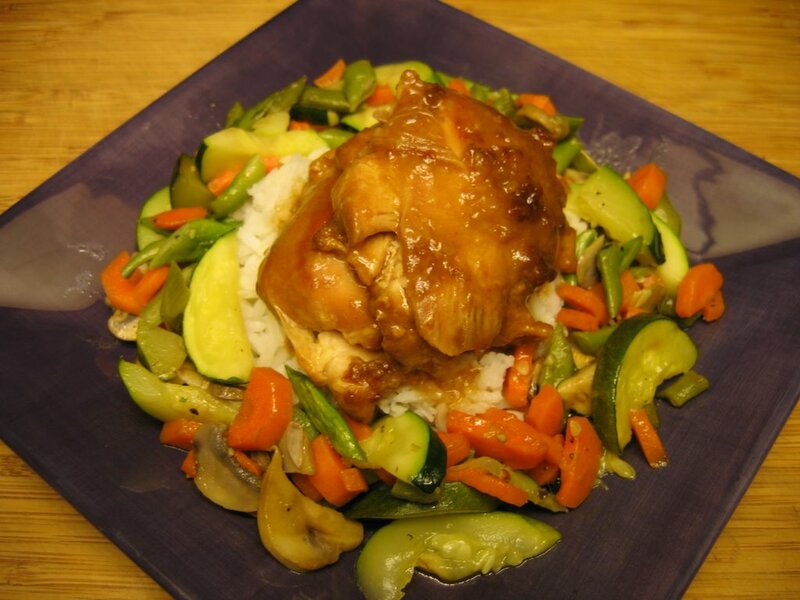 I stumbled upon Thai-Style Chicken Thighs. That was just up my alley! The directions give you ways to cook on low for 6-7 hours or fast (HA!) 3-4 hours. I chose the fast method. It would give me enough time to do some serious knitting. 6-7 hours of knitting is just way too much and besides the guilt would eat me alive! Coat slow cooker with cooking spray. Combine ginger, salt and pepper; sprinkle over meaty sides of chicken. 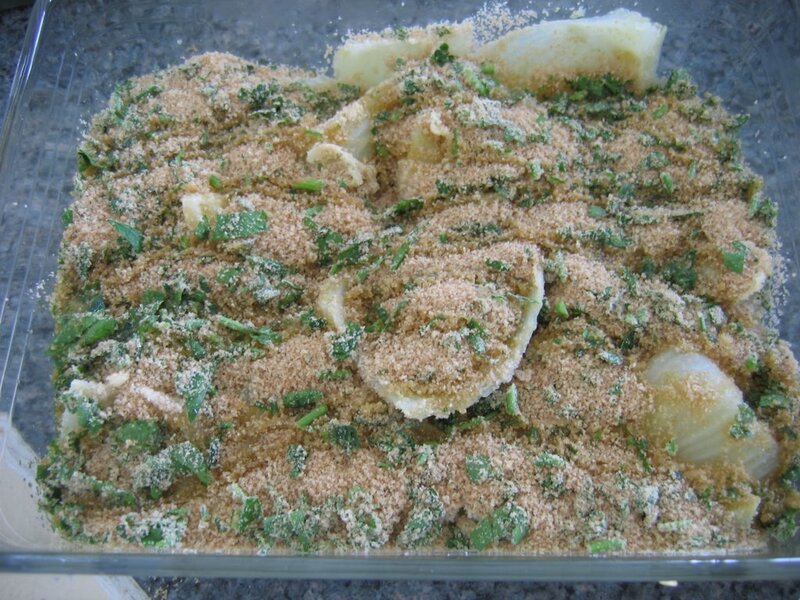 Place onion and garlic in slow cooker; top with chicken. Whisk together coconut milk, peanut butter and soy sauce; pour over chicken. Cover, and cook on LOW for 6-7 hours or HIGH for 3-4 hours, or until chicken is tender. With slotted spoon, transfer chicken to serving bowl; cover with foil to keep warm. Turn slow cooker to HIGH. Combine cornstarch with water until smooth (this is called a slurry). Stir into juices; cover and cook 15 minutes or until sauce is slightly thickened. Spoon sauce over chicken. Serve chicken over couscous; top with cilantro. Garnish with lim wedges, if desired. As many of you know who read my blog, I never follow as directions. Sadly that also follows through to my knitting. So here is my "not following the directions" account of how I did the chicken. I did not want to have to make the slurry and have to wait until it thickened in the crockpot while my chicken sits on a platter cooking off foil or no foil. So I mixed all the ingredients for the sauce part, and threw it all in. After doing that I see why you need to use some non-stick spray. 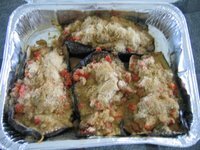 The sauce gets really thick and starts to get dark, if not burned, around the top edges. Lesson learned? None, I will do it that way again, use some hot water and dish detergent and let the crockpot soak overnight. Since we have the garden going strong, I needed to use some of the bounty. I sauteed some Kentucky Wonder green beans and cut them into 1/2" pieces. I used zucchini that we had picked that weekend. The carrots and mushrooms came from the grocery store. 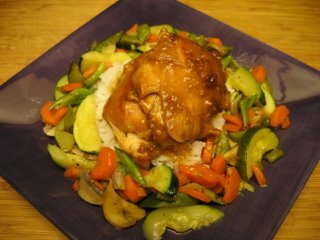 The chicken and sauce were over Jasmine rice I needed to use up. The recipe is good and you can add more heat to it by adding more cayenne pepper. 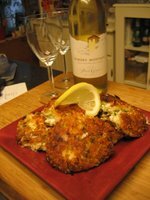 I go to about 15 cooking blogger sites and one of my favorites is Is it EDible? Ed and I have something cute in common...our love for our puppies. I have four and Ed has one but she is a total cutie! You will see her on the front page of his site. I have wanted to try several of Ed's recipes but this one really appealed to me. It's Orange Sherbert. What caught my attention was two of the ingredients. I don't digest milk products or sugar. 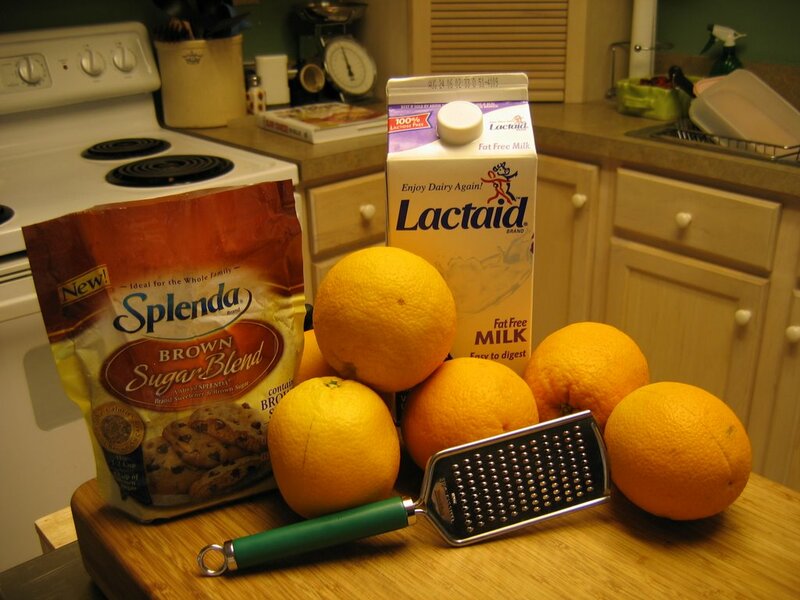 Ed substituted Splenda for sugar and I used my Lactaid milk. It was perfect. The recipe couldn't have been simplier. Below are the ingredients. Too easy. 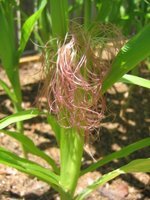 Below is the end result...it hit the hot summer spot. 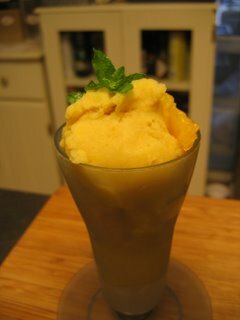 I used my Krups ice cream maker and it took less than 15 minutes for it to get slushy. I had these great Tupperware parfait glasses in the back of a cabinet and decided they would be perfect for serving the Orange Sherbert. The cool thing about the glasses is they have a bottom that you can pop off and just put the glasses in the freezer laying down on their sides. When you want to serve your Orange Sherbert, you just pop the bottom back on to the glass and you are good to go. Thanks Ed for such a simple tasty recipe! I guess there are not a lot of you posting at this time of the day on the weekend so loading pictures has gone more smoothly today. I wanted to get these done before I head off to my monthly food demo at the Fresh Market. I will be back to report on that later! 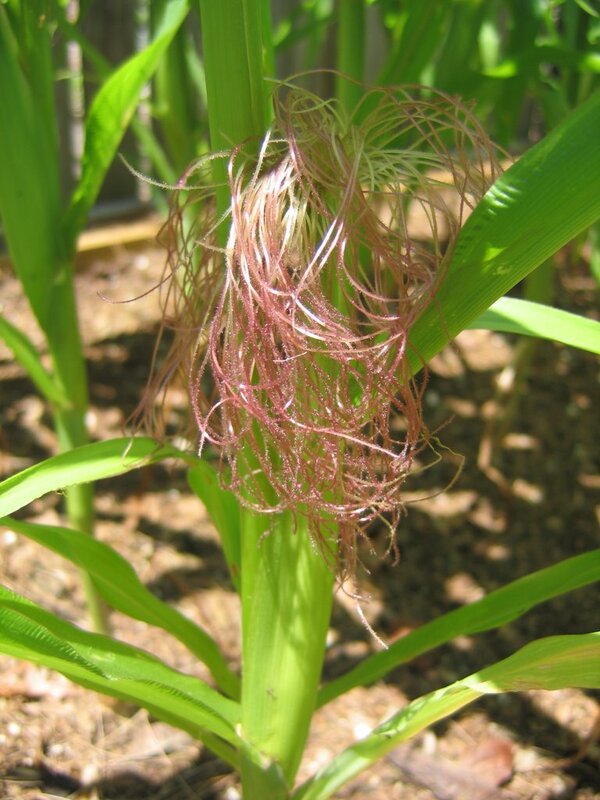 Here is a picture of a baby corn just getting it's silk. Since there aren't really any flowers to speak of this is as good as it gets. 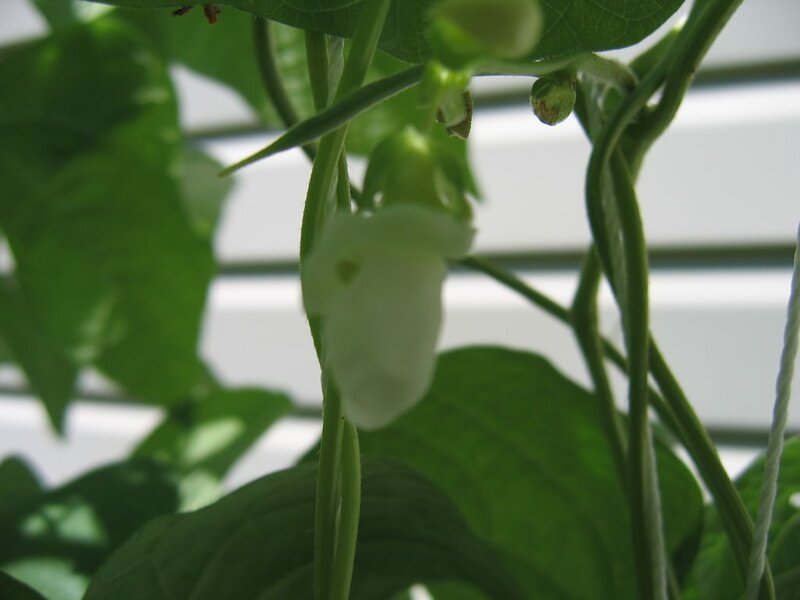 I was fast enough to get the green bean blossom right before it dropped off. We had a wicked rain and many of the blossoms got pounded off. So our green bean crop is slow to recoup from the rain. Here is one of our first green beans. Don't ask me what kind it is, I don't have a clue. I picked 5 yesterday in varying sizes. At this rate one summer might produce a zip bag full. We planted three double rows of bean expecting more than 5. One bed got dumped on the by the neighbor's gutter being full. All the rain water got bogged down by pine needles and everything that wasn't able to drain, spilled over onto the third bed. So those plants are looking very pale and sad. July26-I tried once again to post more pictures and was not able to. I am not sure if it's my Virus program (which has this and flickr as exceptions) or my photos are too large. I went to flickr and downloaded my photos and marked them as small. I tried to load from flickr to here to finish off my garden pictures but nothing worked. I will try again later after I get home from work. This is really frustrating! This entry has to do with before and after in our surburban garden. I went out last week and took some pictures. With Flickr and Blogger having issues lately, I was not able to post the pictures. So, hopefully today will be my lucky day. 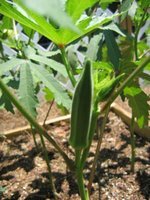 Okra grows vertically. When it first starts out the leaves are small and more compact. 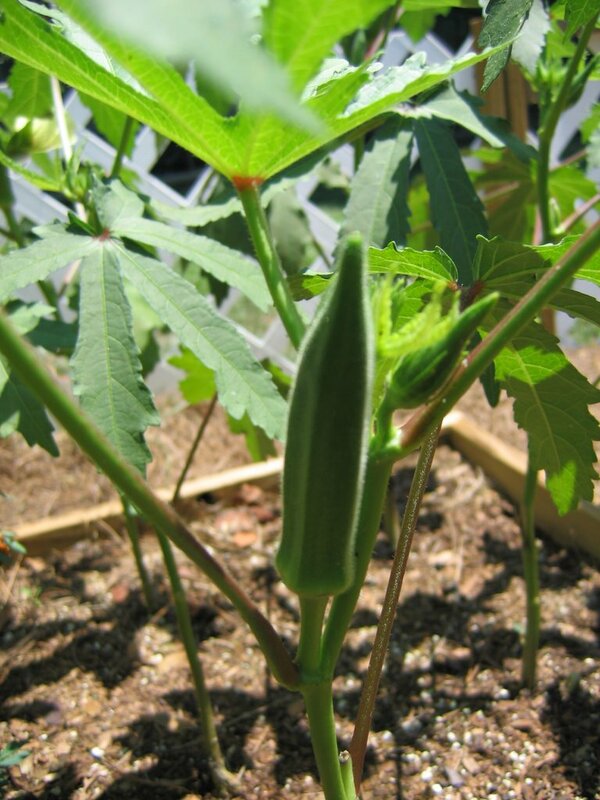 I have noticed now that our okra is getting taller, their leaves are spreading out and are getting larger. 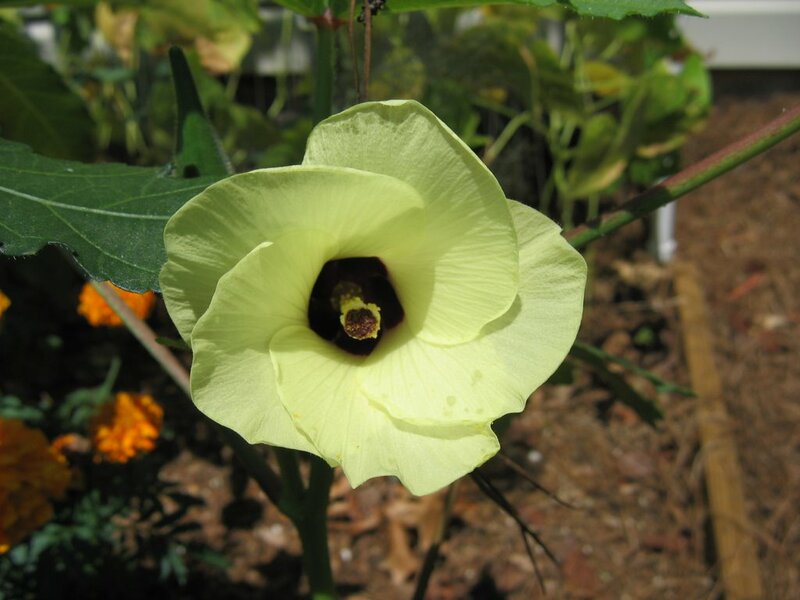 The okra flower drops off and this appears. I try and cut them about 3-4 inches in length. They seem to grow pretty rapidly. If you don't pick them on the smallish side they get woody and are no good to consume. 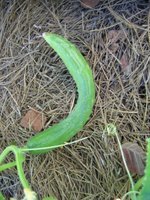 ... and this is the cucumber grown to a nice size; about 8-9 inches. They are prickly on the outside, but really good on the inside. 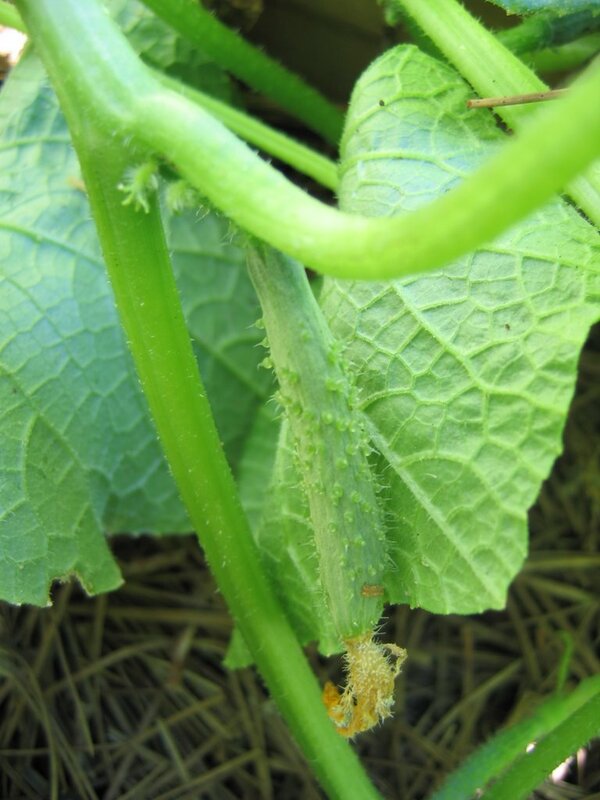 When you wash them the little prickly hairs come off and the cucumber is no longer "hairy" but bumpy. They are very mild in taste. 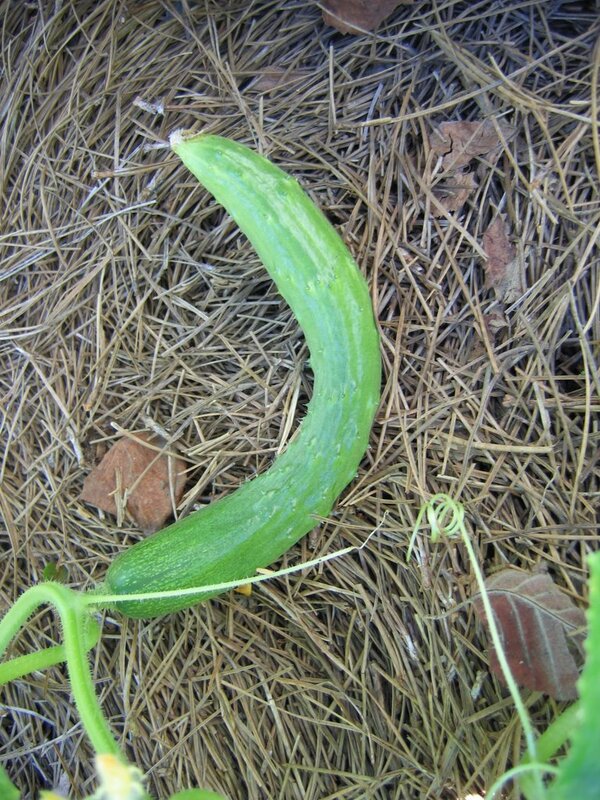 This is the cucumber at about 8-9 inches. We have put down pinestraw down on all of our garden pathways to keep the weeds down. When it gets hot and humid, I hate going out to weed. I have more pictures but guess I have reached my picture posting limit with Blogger. This is really frustrating. I will post the rest on another day when I can get things to post in a timely manner. I work all day as many of you do and when I get home more times than not, I am dead on my feet. I think it's even more stressful for me because I am in the food business and have three part-time jobs (really four) that all involve food in some way, shape or form. My first job is of course my personal chef job. Second is working a local chain grocery store where I work four days a week in two different departments. Third, I do a food demo once a month on a Saturday for about three hours. I have been doing this one for three years. The fourth job is only one day a year (at present) teaching ServSafe classes to personal chefs who attend my association's national conference once a year. So you can see that my mind is going a thousand different directions at once; sort of like being the mother of small children. I may from time to time use things that aren't homemade and come from a jar. I know, it's awful, but you have to do what you have to do. Last night was a "jar" night. I used to Newman's spaghetti sauce and ground beef to make spaghetti. I really didn't feel like a salad and have something from the garden that I needed. So dinner was basically on the fly. 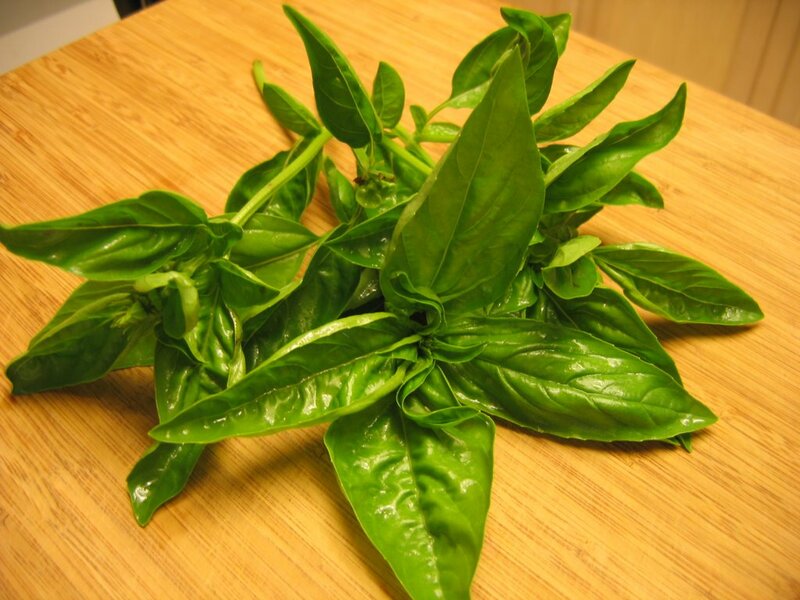 I bought three basil plants from organic store at the farmer's market and they finally took off. 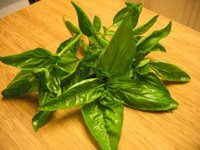 I am so afraid that they will go to seed so I am thinking of anything but Pesto to use up the basil while it's pretty. While I think Newman's spaghetti sauce is great, I needed to kick up the flavor a notch so I picked some of our basil and threw it in. Then I have to use these. Yes, they did come from our little suburan garden. 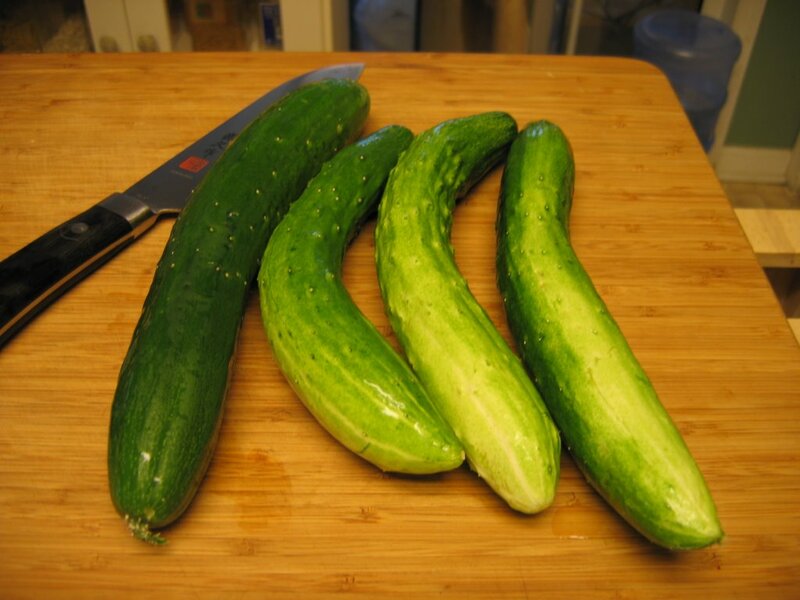 I am shocked at how fast they are maturing so I am searching for lots of ways to make recipes with cucumbers. This is one that just came to me. I know I must have eaten a version somewhere in life and remembered it was a mixture of flavors. Luckily I had all the ingredients that I thought I needed. I made a cucumber and tomato salad. I was lucky enough to find two vine ripe tomatoes and the rest of the ingredients are usually on hand. I used some apple cider vinegar, a pinch of granulated sugar, canola oil, salt and pepper and some dried dill weed. 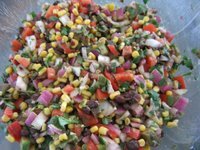 All those ingredients were whipped up in a small bowl and then poured over quarter sliced cucumbers, tomoatoes and some small diced onions. 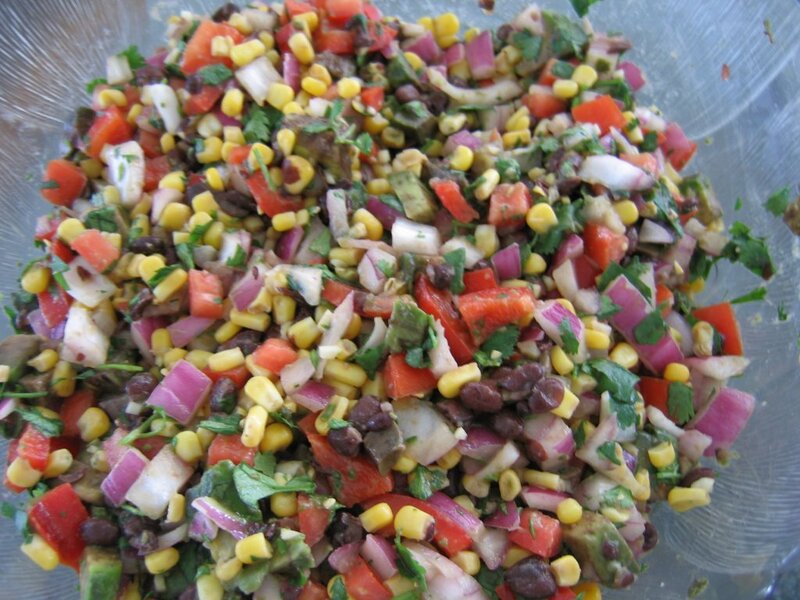 I let everything sit in the refrigerator for about 30 minutes, gave it a toss and I had my side for dinner. As usual I can not get the final picture to post. I have tried all day but Blogger will not let me post it. 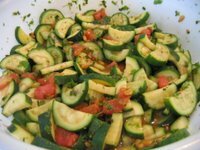 So if I can go back and amend the post at a later date I will post the final picture of the Cucumber and Tomato Salad. Since I couldn't get the rest of the pictures for my cookday on Monday to post I thought I would try again. I had heard an old wives tale that if you leave the pit in the Guacamole it wouldn't turn burn. I can varify from the client on Monday, that's not true. 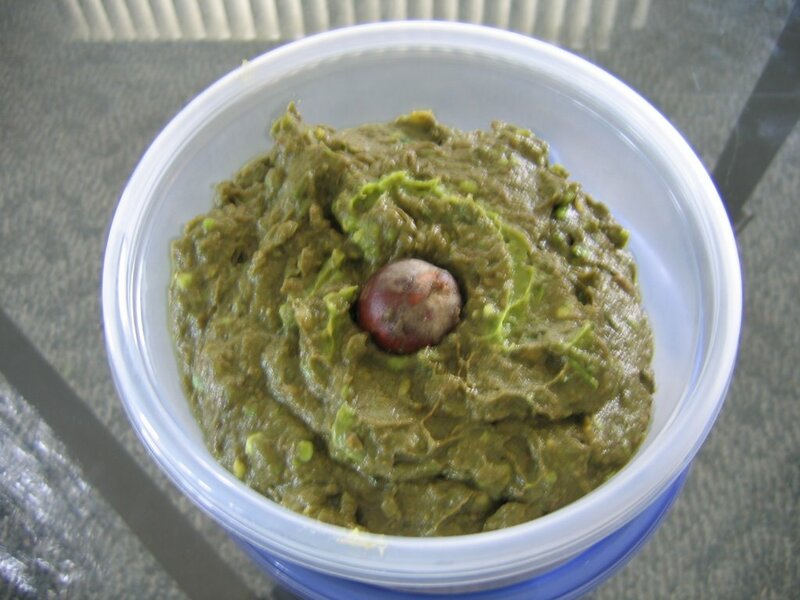 When I loading Tuesday's food, I did see brown in the Guacamole bowl. 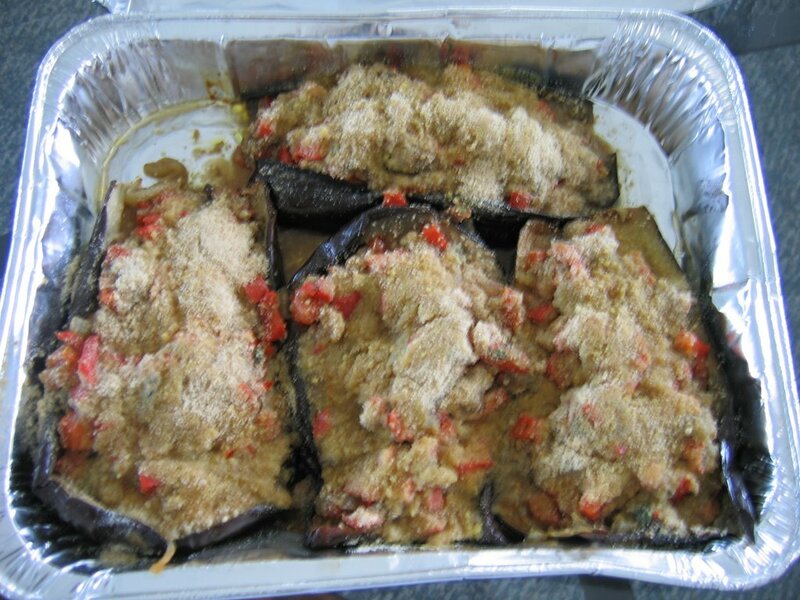 Baba Ghannouj is baked eggplant, with various ingredients and then all of that is pureed. 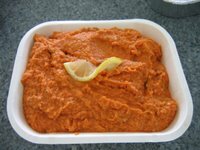 It's meant to eaten warm with warmed slices of pita bread. 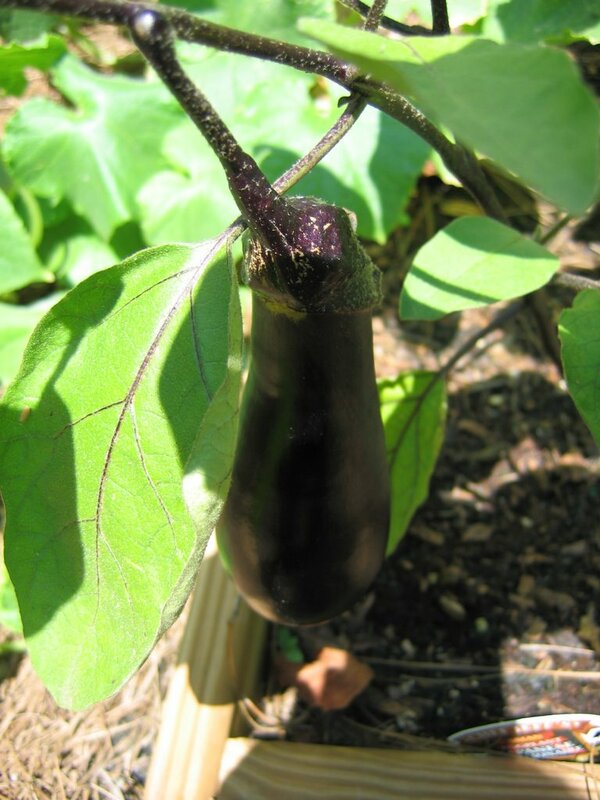 I didn't used to be a huge fan of eggplant but the last few years, I have just loved it anyway it's fixed. 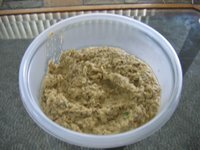 This is an Indian (India) recipe. 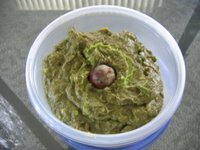 It's very easy to make and even easier to eat! I know this is covered with organic bread crumbs and you can't see the Fennel too well but it is under there. I have never baked it but have used it with tomatoes plenty of times over the years. Most folks have no idea what it is and when they hear that it has a licorice test, they baulk at the thought of eating it. Once the fennel is split into quarters and then boiled for about 10 minutes, there is only a faint flavor of licorice. 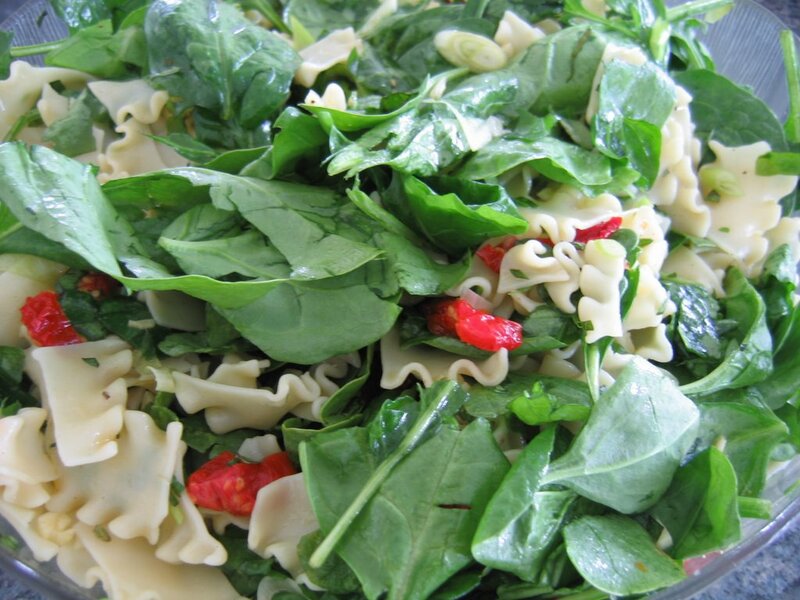 I could not find an Farfalle pasta at the organic store, so I substituted with another kind of pasta. Using a flat small pasta works the best. Penne is too heavy for this pasta salad. Here is the rest of the menu for Tuesday...I sadly did not act quick enough to get pictures. Lentil (Red) Chickpea Burgers with Coriander Garlic Cream (I did not make the Coriander Garlic Cream. 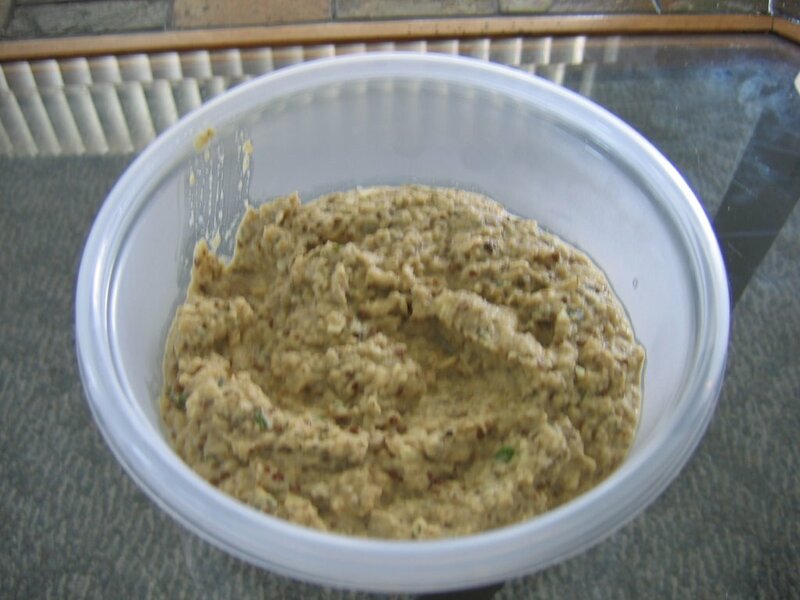 I could not find a good Vegan substitue for cream, so I bought Veganaise and added the spices and garlic to that for the client to spread on their whole wheat hamburger buns. I left them sliced tomatoes and lettuce leaves for the burgers. 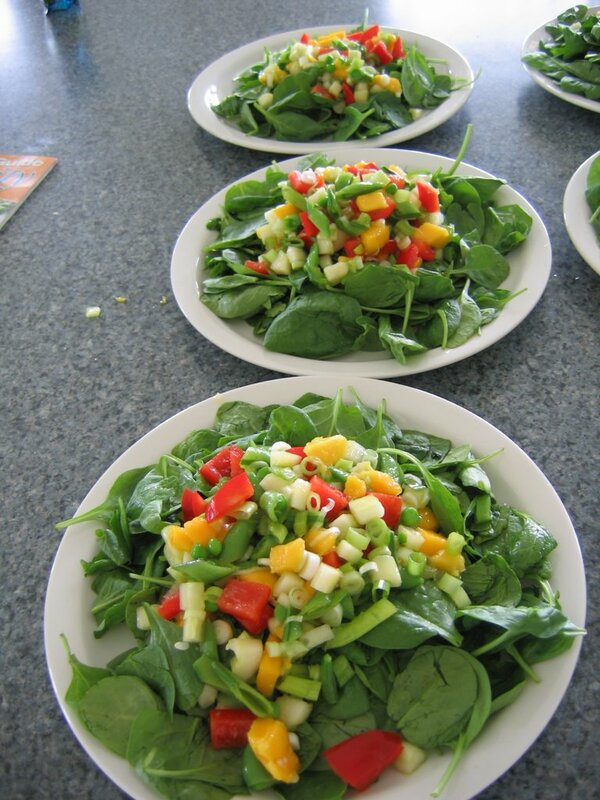 Hawaiian Salad (this is a strange list of ingredients but this is my second year to make this for the clients) The ingredients are-green peas, red grapes, cantaloupe, oranges, apples, pecan pieces, bibb lettuce, roma tomaotes, mint, canola oil, and cider dressing. I hope that I am invited back to cook for some of the family members again, but if not, it was a wonderful experience and I got to try tons of new recipes. 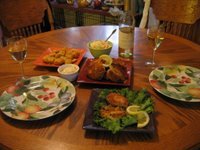 I have been lucky enough to cook for some folks who come down once a year to vacation in my fair city. This is my second year to cook for them and if I get lucky I will be asked to come back for a third year. One member of the family has a medical reason that he eats Vegan. For those of you who are meat eaters, that means that nothing with a face is consumed, even honey for some vegans. So I get to play once a year with different grains and vegetables that I don’t usually cook for my meat eaters. So they try new things and I get to enjoy learning new things as well. Usually I make 5 salads, and 4 dinners with a slew of sides to go with each dinner. I didn’t repeat a lot this year. So there were some new things for them to try and hopefully fix once they get home. I always print off the recipes and leave them with the family. So here we go through the things that I fixed for the last three days that I cooked for the family. I wanted to post more pictures but I think I have capped out on photos with blogger for today. I have some more pictures and will post them when I can! The blue can on the top is Michelle's crab and the tub on the bottom is mine. Michelle's was four ounces and mine was a full pound but the recipe was scaled to fit each correctly. Here are all the ingredients gathered up and ready to go. 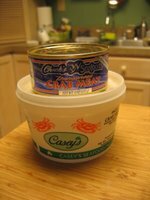 I thought that four egg whites was way too much for the pound of crab so I did only use three and the fourth one was for Michelle's crab. 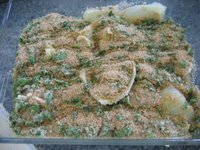 Everything was chopped, minced, whipped and then folded together. 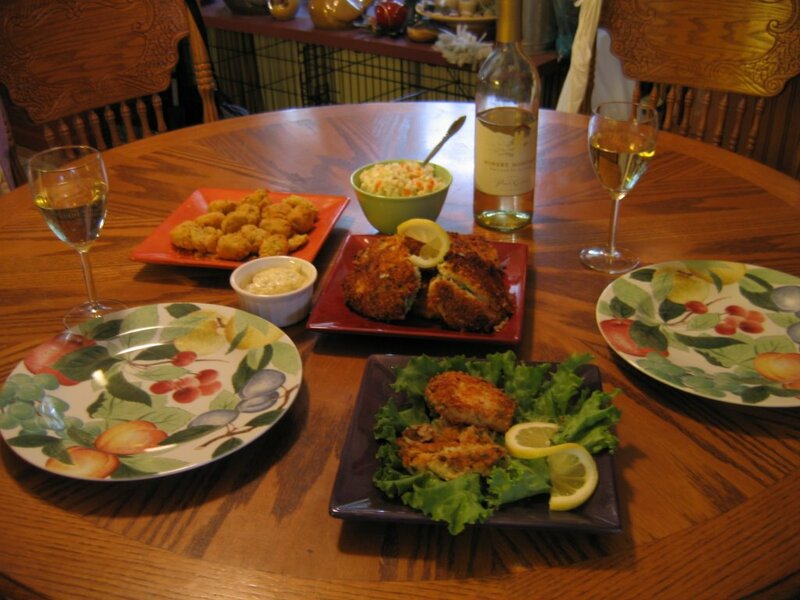 The patties were formed and the cakes were lightly fried in canola oil (please do not mention the okra disaster). I thought that a bottle of wine would round out the rest of the meal nicely so I picked a bottle ($10-I am totally a BIG spender-LOL!) 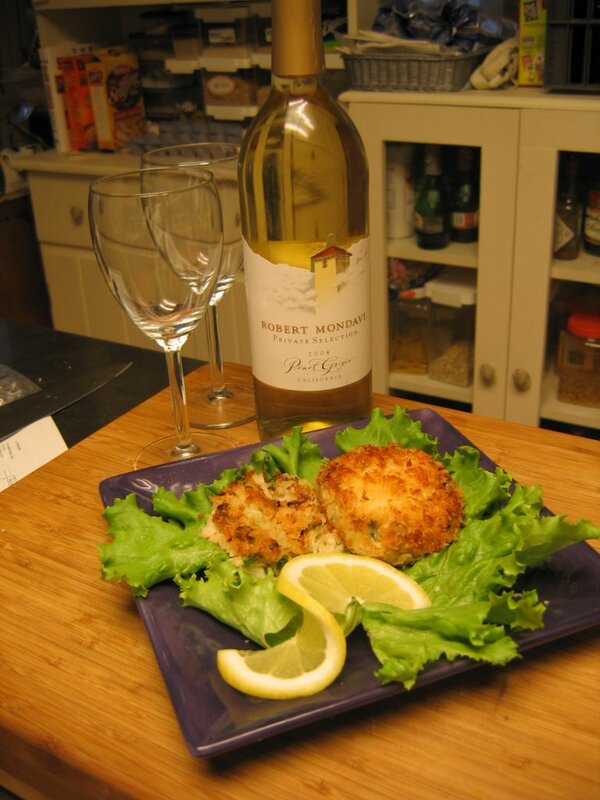 of Robert Mondavi Private Selection 2004 Pinot Grigio. It went really well with the dinner and hubster said he liked it better than the oakey Chards that I usually pick. We had cole slaw (yes, he did go to KFC for that), hush puppies, tarter and cocktail sauce. I was stuffed and felt like the whole dinner was a success. Now for the taste taste results. I am a huge crab lover. I would almost rather eat crab than lobster. I said almost. So hubster and I tasted each tasted the west coast cake first (company from Oregon always goes first) and then the east coast crab. We both decided that the west coast crab was sweeter than the east coast. 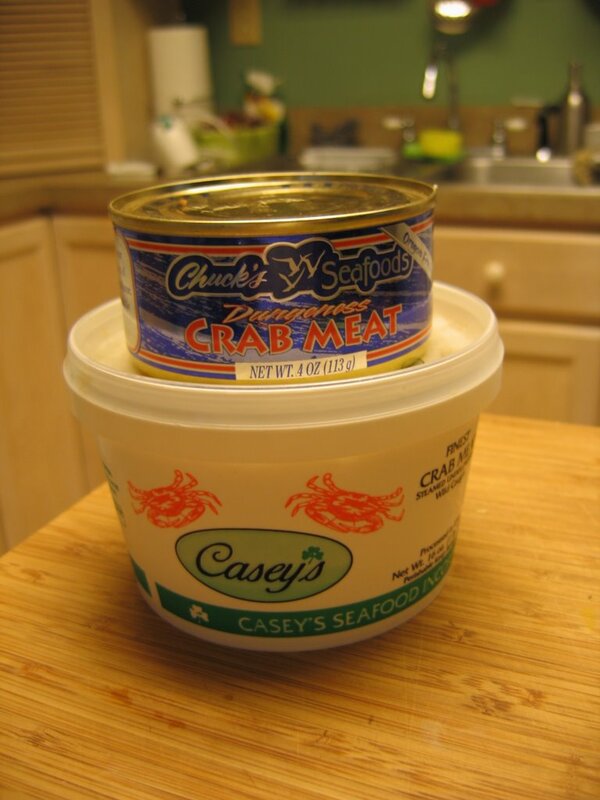 The texture was more stringy and even looked more translucent than the other crab. So we think we need a larger sample and might just have to go to Oregon to eat some more to continue our research. My best wishes to Michelle and the Loving Boyfriend for a lovely wedding in the spring no matter which coast they choose. I have bookmarked all the airlines to book my reservation to attend the wedding. Can we please put in a vote for Hawaii? I need to scuba dive, bad! I think that just about everything I feel about food was established by both my grandmother and mother. My grandmother was a plain little old lady with very basic tastes. I don't remember many "instant" foods in her house when I was a child visiting with her during the summers and holidays. 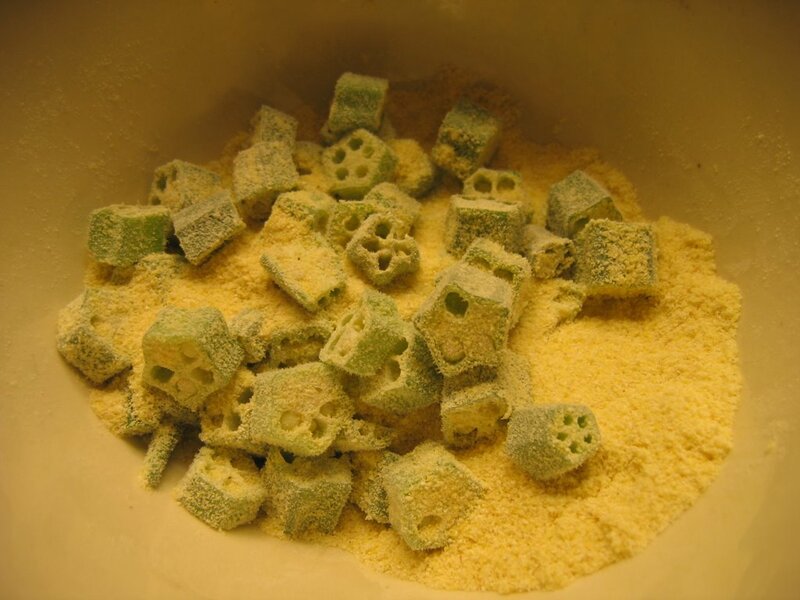 One of my most favorite foods that I hardly ever eat because of how it is prepared, is fried okra. Now stop groaning and saying things like "that's gross" or "eek, it's slimmy". I hate grits but I love okra. Go figure. I haven't talked a lot about our little suburban garden but we actually got to pick some okra last night. I had big plans for the 8 little pods we picked. I was going to cut them up... and make it the same way I vaguely remember it being done when I was 5. Yes, that was a very long time ago. Memories, fade or just flat out go away. So I remember that the okra was always rolled in corn meal and then fried in grease in a black cast iron skillet on a very old gas stove. 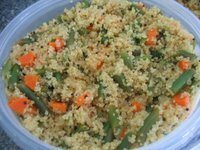 I had the corn meal and I did toss the okra in it. I don't have a cast iron skillet but hey, it's only a skillet right? So I whipped out the Revereware skillet and poured some Canola oil. I have an electric stove but it does get pretty hot when I crank it up. I was not going to be bogged down in little details from my 5 year old memory. I trudged on. Then I fried the okra. I took a piece and ate it. No, it wasn't quite right. Something was missing. Not enough corn meal was sticking to the okra. Okay, what can I do to make it more sticky (like the stuff isn't slimmy enough?) I cracked an egg and dipped out the frying pieces. What was I thinking? I was going to make this work if it killed me. After the half greasy and very hot okra was covered in egg, I put the stuff back into the skillet to fry some more. I made a HUGE error in cooking judgement. 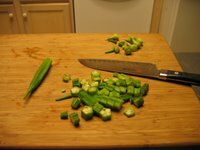 Once the okra was fried to a nice brown, I fished it out of the oil and let it drain on a few layers of paper towels. I got my trusty fork and took a bite again. GAG. It was tough and had no taste of okra. What a huge disappointment! I will not be beaten by okra. So now I have to go and buy a cast iron skillet, season it and try all over again. I would post the final picture of the fried okra but for some reason I can not seem to post any pictures since I first started this blog entry. Typepad is looking better and better everyday!